Stay tuned for upcoming events for Student Acknowledgement Program II in near future. 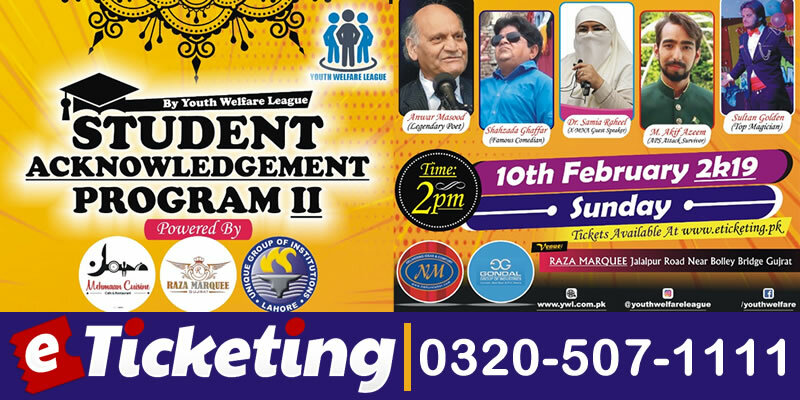 Student Acknowledgement Program II will be held on 10th February 2019 at Raza Marquee in Gujrat, Pakistan. It is being organized by the Youth Welfare League. The fundraiser will feature magic show for children, speech competition, quizzes and more. Come join the Youth Organization of Gujrat based Youth Welfare League in this noble cause. Get ready for Student Acknowledgement Programme II 2019. Youth Welfare League is a social welfare organization in Gujrat, Pakistan. Terms & Conditions : Youth Welfare League reserves the right of admission to the venue and event. Best Viewed at 1024 x 768 pixels and above. This Page loaded in 0.08115 seconds on Tue, Apr 23, 2019 (20:57).